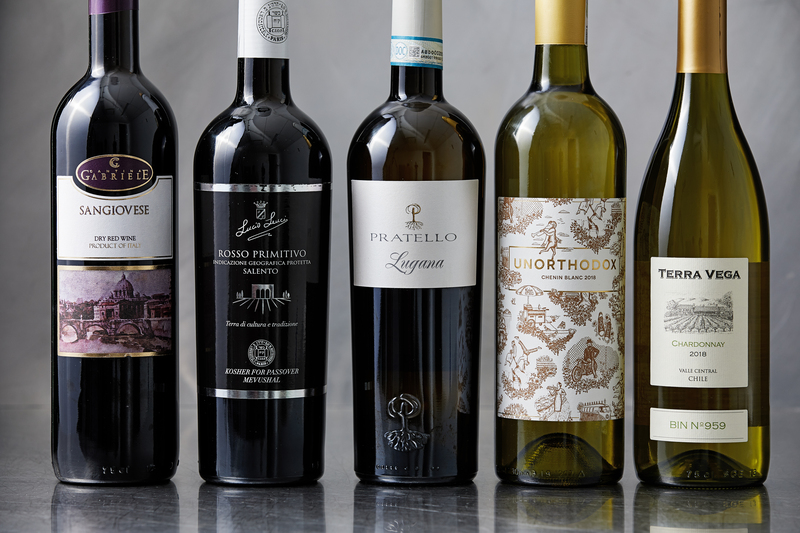 Passover is April 19-27 this year, so it’s time to look at some kosher wines. As I noted last year, the quality of these wines appears to be getting better. This year’s four recommendations include a textbook chardonnay from Terra Vega winery in Chile, a deal at $10 and the greatest value of the week. I’ll confess I was more excited by the sangiovese from Cantina Gabriele in Italy, a delight for $13. We also have an earthy primitivo from Leuci Lucio in Italy and a delicious, juicy chenin blanc called Unorthodox from South Africa. And it’s also worth noting that because of rabbinical requirements, all kosher wines are vegan. Imported by Victor Wines, distributed by M. Touton Selection: Available in the District at Barmy Wines & Liquors, Cleveland Park Wine and Spirits, Eye Street Cellars, Potomac Wine & Spirits, Rodman’s, Wine Specialist. Available in Maryland at Bradley Food & Beverage and Georgetown Square Wine and Beer in Bethesda, Downtown Crown Wine and Beer in Gaithersburg, Dugans Discount Liquors, Kosher Bite and Wine Loft in Pikesville, Hop N Grape in North Bethesda, Knowles Station Wine & Co. in Kensington, Mom’s Organic Market, Moti’s Market and Rollins Beer-Wine-Deli in Rockville, Old Farm Liquors in Frederick, Town Center Market in Riverdale Park, Wine Source in Baltimore. Available in Virginia at Chain Bridge Cellars in McLean, the Wine Outlet in Vienna. Imported by Victor Wines, distributed by M. Touton Selection: Available in the District at Cleveland Park Wine and Spirits, Eye Street Cellars, Rodman’s, Whole Foods Market (P Street). Available in Maryland at Bradley Food & Beverage in Bethesda, Choice Wine & Beer in Wheaton, Village Liquors of Clarksville in Clarksville, Dawson’s Market, Moti’s Market and Rollins Beer-Wine-Deli in Rockville, Downtown Crown Wine and Beer in Gaithersburg, Dugans Discount Liquors, Kosher Bite, Miller’s Delicatessen and Wine Loft in Pikesville, Hop N Grape in North Bethesda, Knowles Station Wine & Co. in Kensington, Quarry Wine & Spirits and Wine Source in Baltimore, Roland’s in Chesapeake Beach, Snider’s Super Foods in Silver Spring, the Wine Harvest in Potomac. Imported by Victor Wines, distributed by M. Touton Selection: Available in the District at Cleveland Park Wine and Spirits, Eye Street Cellars, Harry’s Reserve Fine Wine & Spirits, Morris Miller Wine & Liquors, Rodman’s. Available in Maryland at Bradley Food & Beverage in Bethesda, Choice Wine & Beer in Wheaton, Dugans Discount Liquors in Pikesville, Hop N Grape in North Bethesda, Mom’s Organic Market in Rockville, Old Farm Liquors and Riverside Liquors in Frederick, Quarry Wine & Spirits in Baltimore. Available in Virginia at the Wine Outlet (McLean, Vienna). Chenin blanc is South Africa’s star white wine, and Zandwijk Wines captures the character of the grape in this juicy example with the humorous name. It offers orchard fruit flavors of peach and apricot, with a slightly off-dry finish. Mevushal, kosher for Passover. ABV: 14 percent. Imported by Victor Wines, distributed by M. Touton Selection: Available in the District at Cleveland Park Wine and Spirits, Eye Street Cellars, Morris Miller Wine & Liquors, Rodman’s. Available in Maryland at Bradley Food & Beverage in Bethesda, Choice Wine & Beer in Wheaton, Dugans Discount Liquors in Pikesville, Hop N Grape in North Bethesda, Knowles Station Wine & Co. in Kensington, Mom’s Organic Market in Rockville, Old Farm Liquors and Riverside Liquors in Frederick, Quarry Wine & Spirits in Baltimore. Available in Virginia at the Wine Outlet (McLean, Vienna). Here’s another lovely white wine that displays Italy’s diversity of grapes. The label says the wine is 100 percent turbiana, and I thought I’d found another obscure grape to cross off my list. Importer Didier Simonin says it’s native to the Lugana region and used to be called trebbiano di Lugana. According to Wine Grapes by Jancis Robinson, et al., that is a synonym for verdicchio. Whatever it is, this beauty offers aromas of white flowers and flavors of orchard fruit, with a hint of salinity and smoke for added interest. This cries out for seafood. I’ve seen online that it is made from organic grapes, though the label does not say so. ABV: 13 percent. Imported and distributed by Simon N Cellars: Available in the District at A. Litteri, Cork & Fork, MacArthur Beverages. Available in Virginia at Tastings of Charlottesville in Charlottesville, Unwined (Alexandria, Belleview); on the list at Renewal in Charlottesville. Dave McIntyre writes about wine weekly. He also blogs at dmwineline.com.